Multinational companies need to manage their relationships with multinational customers with a globally integrated approach. This book provides a systematic framework for developing and implementing such global customer management programs. It draws on in-depth research at over 20 major U.S. and European multinational companies, such as ABB, Bechtel, BP, Bosch, British Airways, Carrefour, Daimler-Chrysler, Hewlett-Packard, HSBC, IBM, Schlumberger, Shell, Siemens,Tesco, Unilever, Vodafone, Wal-Mart, and Xerox. Readers will learn how to* think about managing global customers in the context of their overall global strategy* develop effective global customer management programs* overcome barriers to implementation and success* build better relationships with important customers* get the entire company to engage with managing global customersThis book takes a strategic, total business, and not just sales approach to managing global customers. It also takes a customer as well as a supplier perspective. The book provides guidance on both strategy and implementation. Yip and Bink's Managing Global Customers takes a systematic and logic driven approach, yet provides many creative insights and practical advice. Managing Global Customers highlights the rewards of taking a step beyond global account management to create a Global Customer Management approach, integrating globally all aspects of the relationship between supplier and customer. The book gives a framework that guides international companies in using their relationships with global customers to their full potential. 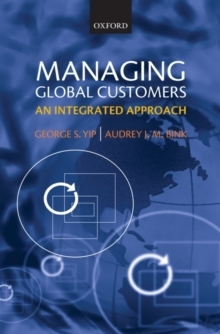 George Yip, author of the widely-praised Total Global Strategy, and Audrey Bink tackle in-depth one of the most important aspects of global strategy: How to manage global customers.